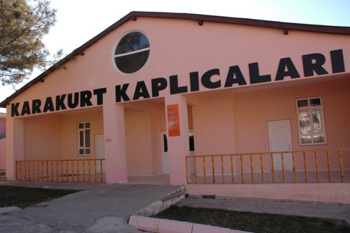 It is in the borders of Karalar Village in the center district of Kirsehir. The distance of spa to Kirsehir is 16 km. The well in 147,65 m depth has got 51 celsius degree and 12 L/Sec flow. There is a motel including 50 beds in the spa. Positive results are taken against many diseases such as rheumatism, neuralgian and gynecological diseases with its bath therapy. There are also historical Karakurt Spa and Kalender Baba Tomb in the village. It is located in the borders of Cicekdagi District of Kirsehir. It is 4 km away from Cicekdagi. The well in 160 m depth has got 38 celsius degree and 3 L/Sec flow. The flow with compressor is 7 L/Sec. In this spa which has the capacity of 20 beds, many positive results are taken against many diseases such as rheumatism, neuralgia, neuritis and gynecological diseases with its bath therapy. In Mahmutlu Spa, two sources were found. The first one is in 311,2 m depth, 73,2 Celsius degree, 40 L/Sec. flow. The second one is in 1149 m depth, 76,5 Celsius degree, 80 L/Sec flow. Hot water from the thermal source is being used at greenhouses as there are no established facility.